A free public lecture by cultural anthropologist Stephen Huyler, part of the Creativity+Innovation series. One in six women in the world lives in India, yet most of us in the West know little about them. 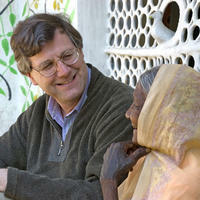 During the past four decades of field research throughout India, cultural anthropologist Dr. Stephen P. Huyler has interviewed thousands of women and recorded their stories and viewpoints. For this presentation he has chosen profiles of seven women drawn from many different geographic, social and economic backgrounds. Huyler focuses on these women’s artistic creativity as a means for deeper exploration of the issues they face in their lives. Complemented by sumptuous imagery, this slide lecture will illustrate contemporary changes in traditional societies and the way in which the women of India are leveraging their innate strength and creativity to meet the demands of a modern world. This presentation is part of the series of free, public lectures in the Dean's Lecture Series entitled "Creativity and Innovation" (part of the course Art 80V: "Issues and Artists" taught by Associate Professor Lewis Watts). Arts Division Dean David Yager has selected nine speakers, all noted for their unique ability to bridge innovation and creativity within their professional career paths. The public is cordially invited. Admission is free. Parking $3. The Media Theater is the lecture hall located next to the traffic circle in front of the Mainstage Theater at UCSC.